Made from our heaviest polypropylene material, these super heavyweight sheet protectors make great looking presentations and reports. Make a lasting impression when it counts! Made from our heaviest polypropylene material, these super heavyweight sheet protectors make great looking presentations and reports. Make a lasting impression when it counts! Outstanding performance with high-use documents, too. No sheet punching necessary. Acid-free protection means no photocopy transfer. Non-glare finish. 50/BX. Super Heavyweight Polypropylene Material --- Provides maximum durability plus outstanding performance in preserving and protecting high-use presentation materials, letters, and reports. 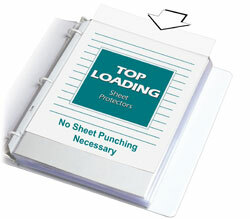 Super heavyweight sheet protectors expand the life of your documents. Polypropylene material provides acid-free protection with no photocopy transfer. Suggested Use: Oustanding performance with high-use documents due to the super heavyweight material being so durable.